Wanderlei Silva (35-13, 1 no contest) possesses one of the most iconic careers in the history of mixed martial arts. Silva’s debut took place in November 1996 at Brazilian Vale Tudo 6; he knocked out Dilson Filho in the first round. In his seventh fight, he made his UFC debut at UFC Brazil in October 1998 against future world champion Vitor Belfort. The night ended quickly for Silva, losing in 44 seconds. He bounced back between UFC, PRIDE and a Brazilian promotion known as IVC for the next year until settling in with PRIDE, where Silva went on one of the greatest runs in MMA history. From August 2000 to December 2004, Silva went 16-0-1 with one no contest. His list of victims included a plethora of MMA legends, including Guy Metzger, Dan Henderson, Yuki Kondo, Kazuyuki Fujita, Ricardo Arona, Rampage Jackson (twice) and Japanese icon Kazushi Sakuraba (twice). The run included Silva beating Sakuraba in their rematch at PRIDE 17 to win the middleweight title and make a record four title defenses. The UFC purchased PRIDE in 2006, and Silva signed a contract with the UFC in 2007. He took on former light heavyweight champion Chuck Liddell at UFC 79 in what many felt was a dream match, pitting two of the greatest strikers of all time. Liddell won the slugfest by unanimous decision. Silva went 4-5 in his second UFC run before retiring in September 2014, when he refused to undergo a random drug test by the state of Nevada before a scheduled fight against Chael Sonnen. He was subsequently banned for life. However, the ban was reduced to a three-year suspension. Silva announced in late 2016 that he had signed with Bellator. He made his debut in the Viacom-owned promotion in June 2017 at Bellator NYC and lost to Chael Sonnen by unanimous decision. On Sept. 29 at Bellator 205, Silva will battle Jackson for the fourth time, exclusively on DAZN. 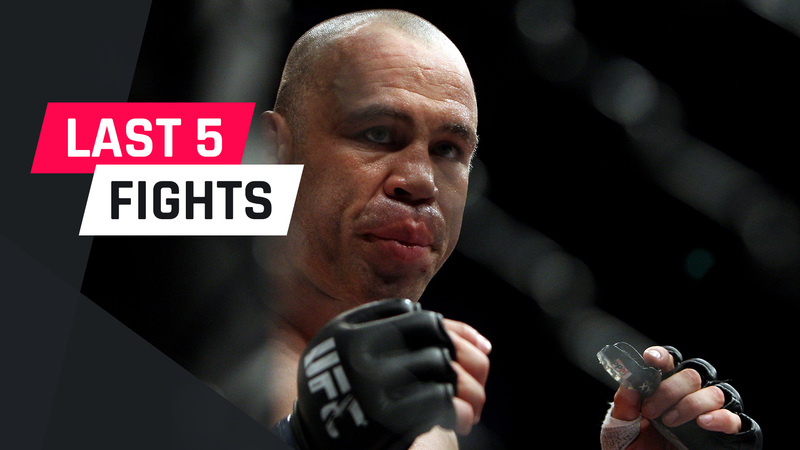 Let’s take a look at the last five fights in the career of Wanderlei Silva. Result: Sonnen won by unanimous decision. Summary: After one of the most intense feuds in MMA history, the fight didn’t live up to the billing. Sonnen used his exceptional wrestling ability to neutralize Silva and his striking attack. Silva had his moments, but he fought like someone who hadn’t competed in almost four years. Result: Silva won by second-round knockout. Summary: This goes down as one of the greatest fights in UFC history, and it took place in Silva’s old stomping grounds of Japan. It was a little over nine minutes of Silva and Stann trading barbaric punches. Each man almost had the other finished until Silva landed the final shot to send Stann into retirement. The fight proved to be Silva’s final win in the UFC. Result: Franklin won by unanimous decision. Summary: Silva had been set to take on fellow Brazilian Vitor Belfort at UFC 147, but a broken hand scratched Belfort from the fight. Franklin ended up taking Belfort’s place, as the two revisited their UFC 99 bout Franklin won by unanimous decision. The second meeting played out nearly identical to the first — aside from Silva nearly finishing Franklin in the second round — and resulted in Franklin taking yet another unanimous decision victory. Result: Silva won by second-round TKO. Summary: This was a battle of two classic strikers in Le’s backyard of San Jose at UFC 139. Le almost had Silva beaten with a spinning back fist but was unable to capitalize. Gathering his bearings between Rounds 1 and 2, Silva came back firing with thunderous knees and strikes, crumbling Le to the mat and and securing the finish. It was a violent display by the fighter known as The Axe Murderer, as Le’s nose ended getting completely shattered by the strikes. Result: Leben won by first-round knockout. Summary: When one saw the matchup, one expected Leben and Silva to stand in the middle of the Octagon and throw everything but the kitchen sink at each other. Unfortunately, we didn’t get to see that, as Leben blasted Silva right away with a series of uppercuts and stopped the MMA legend in one round.